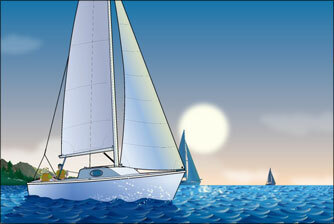 Looking to take a sailing course? Sailing 101! Everything you need to know before you set sail! From bow to stern, we put you at the helm.Gain a true understanding of every part of the boat, what they do, and how to handle yourself out on the water. What do you do if someone falls overboard? How do you deal with heavy weather? We take a look at the most on-demand conditions and scenarios on the water! Designed for sailors of all types and levels. This online course is designed to provide you with essential safety information that you can use immediately on the water. It is for anyone who sails, boats, cruises or races on both inland and coastal waters. This course satisfies the requirements for Coastal Races being sailed under United States Special Equipment Regulations 4.3.2.